Navy Master Chief Boatswain’s Mate Ed Bennett, a Milford native, plants the American flag and Maine's state marine flag atop Guam’s tallest peak, Mount Lam Lam, making him one of the first to celebrate Maine's 199th birthday on March 15, 2019. Friday marked Maine’s 199th birthday, and Milford native Ed Bennett became one of the first Mainers to celebrate it. 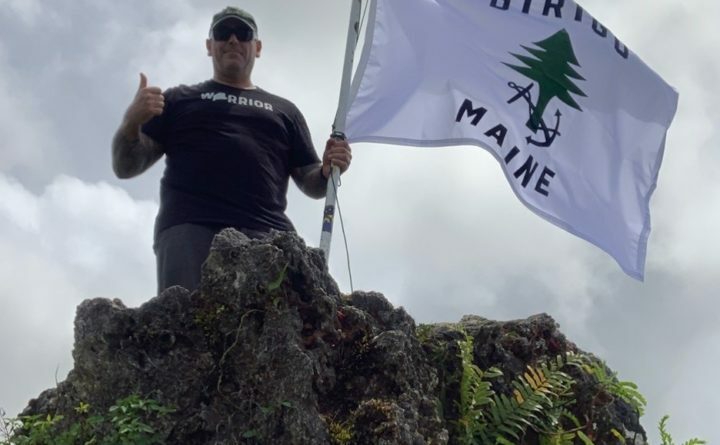 Bennett, a Navy Master Boatswain’s Mate who is currently deployed in Guam, climbed to the top of Mount Lam Lam to plant Maine’s merchant and marine flag at the island’s highest point. Because Guam operates on Chamorro Standard Time, 14 hours ahead of Maine, Bennett became one of the first Mainers to celebrate the state’s 199th birthday. A Navy veteran of 26 years, Bennett started the tradition of planting the flag in a foreign locale back in 2008 during a deployment in Iraq. Since then, he’s also planted it in Colombia, Panama, Guatemala and aboard the aircraft carrier USS Gerald R. Ford. Mount Lam Lam has an elevation of 1,334 feet, but it’s also part of a submerged mountain that rises about 37,820 feet above the Marianas Trench, the deepest natural trench in the world. As a result, Mount Lam Lam reaches a height of 39,154 feet from its base to the peak. If sea level wasn’t a factor, the mountain would be considered the tallest point on Earth, surpassing Mount Everest by more than 10,000 feet. Correction: A previous version of this article misidentified the flag Bennett planted.